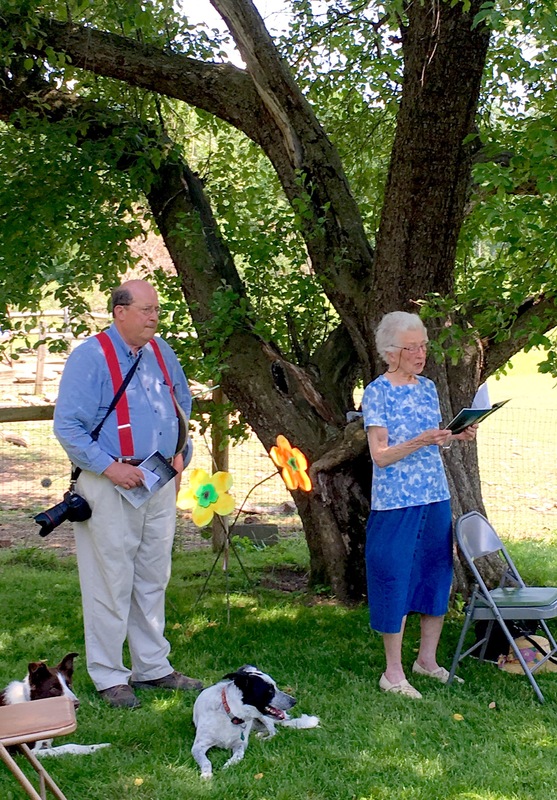 Over the past weekend I found myself reading at the Bedlam Farm Open House in the company of several fine poets, including Mary Kellogg, pictured above, and Kate Rantilla. I was honored and excited to be among fellow women poets, each of us representing a different generation. Despite the gap in our ages, the one thing I can say is that all three of us write with the natural world as our greatest source of inspiration. It was interesting to hear the similarities in our work. But we each still had our own voices, our own meanings and interpretations, and created unique poems in both sound and style. Like me, Mary wrote poetry all her life, but had never showed her work to anyone. She is an inspiration herself, living alone at age 86 on a farm in Hebron, New York, beautiful and sassy and still full of life. When she inquired about where I lived and I said Hartford, Mary asked if I went to the school. I was dumbfounded for a moment. She thought I was still in grade school (I’ve been told I look young, but that seems quite a stretch to me). I told her no, I was 43. I then proceeded to complement her on how young she looked, and we both shared a pretty good laugh about it. Kate Rantilla began writing her poetry not long ago, only recently discovering her talent, and flourishing in her newfound voice. She has published her own book of poetry, and was so encouraging and helpful to me during the process of publishing Gone to Ground. And poet Tom Atkins also read. The only male in our group over the weekend, he read his lovely, lyrical poetry aloud. I was happy to hear him, as well. His style of reading is as beautiful as the words he writes. It was such an honor for me, to be among these people, sharing our work, our love of words, with each other, and with other people. The weekend was idyllic, sunny and warm, even for June in upstate New York. People gathered around us in the welcoming shade of Jon and Maria’s giant old apple tree. Jon introduced each of us, sharing a bit of our unique stories. Everyone sat quietly, respectful, listening as we read. Except for the sheep, at times; but you can’t really blame them, they’d just been sheared. I’m sure they were thrilled to be rid of their wool at last. I hadn’t read aloud in years. At first I felt myself a bit timid and shy, especially trying to compete with the rather humorous bleating of the sheep. But as I continued to read, looking up occasionally to see if anyone was listening to me, I could hear my voice grow stronger. I gathered energy from the crowd, I think, sensing they were actually interested in hearing my words. Particularly when I read the poem I knew Maria liked so much, No One Could See, I felt a great surge of connection, both to her and to the people gathered around me. It is one of my more dramatic poems, I think, one I’m quite proud of. It was born out of a very dark feeling that transformed into something magical, inspiring, that reaches out to that same dark place in others and (hopefully) changes them, too. After my reading was over, I was pleasantly surprised to find people wanting to speak to me about my poems, or have me sign copies of my book they’d purchased. It was a strange sensation, being noticed, sought out. Not something I am used to, really, but that I gradually felt myself grow more comfortable with as the weekend went on. Later in the afternoon at Battenkill Books, I found copies of my book waiting for me to be signed, some with requests for more personalized inscriptions. Again, a rather strange but very flattering sensation. Connie, the owner had me sign more. She put a sticker reading, “autographed copy” on each one. Another new feeling for me, thinking people might prefer to have a book with my signature on it. On Sunday evening I was worn out from the weekend’s excursions. Too much excitement, too much being around so many people for such a long time. Though it was wonderful, I spend most of my time alone really, writing, working around the house or in the garden. When you lead such a solitary life, it can often take a lot of energy to put yourself out in front of people, especially large groups. And to be the focus of attention, even for only a few minutes, is a strange thing for me, indeed. So it felt good to be home, quiet again, to wait and see what this new chapter of my story brings. But I think back very fondly now of meeting Mary, talking with Kate, reading with them both on that beautiful day under the apple tree, breeze blowing and the sun shining down. I hope to go and visit Mary on her farm, to talk and hear her story. I hope to see Kate again soon, too. She said we were like a sisterhood of poets gathered there that day, and I felt it, strong and true. It is a great thing to find (at any point in life) that you belong somewhere, with some people, who’ve been traveling the same road you were all along. One day you meet them, recognize each other, and your lives are all the richer for it. For me, it was one of the great wonders of the weekend to finally meet more fellow travelers. Quite a small blessing when life is filled with troubles and sorrows, the things that so often cause poets to write their verses in the first place. Poetry isn’t for everyone, but it definitely is (and continues to be, I hope) for the three of us.